Stanislaus State recently receive grant funding to help combat student food insecurity, some of which will be used to relocate and improve the campus food pantry where hungry students can find relief free of charge. Over a quarter of students at Stanislaus State suffer from food insecurity, and new grant funding awarded to the university hopes to combat that problem. The university recently received a $105,000 grant from the California State University Chancellor’s Office as part of the CSU-wide effort to eliminate hunger on California’s college campuses. As part of Senate Bill 85, the CSU was able to distribute more than $2 million across its 23 universities with awards ranging from $40,000 to $155,000. Senate Bill 85 – signed into law in June 2017 – allocated $7.5 million in support of Hunger-Free College Campuses. The state’s investment provided the CSU, University of California and California Community College systems each a one-time $2.5 million allocation to expand the fight against student hunger. When CSU Chancellor Timothy P. White visited Stanislaus State in 2016, he highlighted the need for resources meant to help students struggling to purchase food. While there are many resources for students who are in need of financial aid, mental health support or even recreational activities, White at the time stated that providing support for hungry students was at the top of his priorities. At the time of his visit, about 24 percent of students throughout the CSU system reported having food insecurity. According to the latest survey conducted by Stanislaus State in order to demonstrate its need for the recently-awarded grant funding, 26 percent of current Stanislaus State students reported downsizing meals or skipping them entirely because they lacked the money to purchase food. Additionally, 21 percent indicated they routinely miss meals entirely because of financial issues. 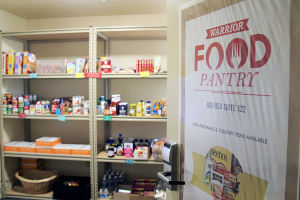 There is currently a food pantry at Stanislaus State meant to help combat the issue of food insecurity. Resident Advisors living in the school’s dormitories, where the pantry is located, said that many of their students utilize available food, toiletries and other necessities available through the school because they either have no transportation to go and purchase affordable food, or cannot afford to purchase food at all. According to Jill Tiemann-Gonzalez in Stan State Student Affairs, who worked on the grant proposal, the funding will be used to establish a new location for the campus food pantry, which will be in the Student Services Building and will have new shelving as well as a refrigerator and freezer. Thanks to the ongoing support of several campus organizations, notably the California Faculty Association, Stan State has continued to maintain the student food pantry. Funds also may be used to support student-based training in food-related health issues – notably, how to assist needy students in applying for California’s CalFresh program, a subsidy that allows the purchase of most foods at markets and food stores.